You should watch the whole documentary here. Fifty years after he broke baseball’s color line, Jackie Robinson is rightfully lauded as an American hero. But it wasn’t too long ago that J. Edgar Hoover’s FBI was monitoring the athlete’s political activities, with an eye towards his contacts with supposed Communist organizations. 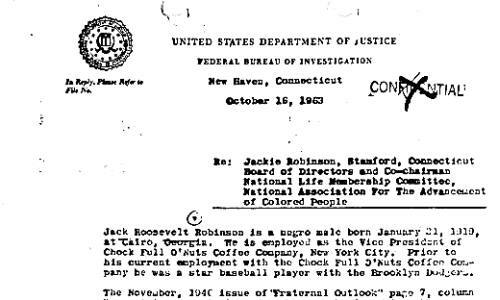 Here’s a 1963 memo summarizing bureau files on Robinson, then a member of the NAACP’s Board of Directors.